The Frugal Family Life: $1/1 Wet Ones Wipes Coupon! 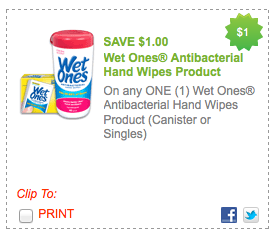 Here is a great $1/1 Wet Ones Wipes coupon that is sure to get us a great deal!! In fact, at a store that doubles we may be able to get them for FREE if we catch them on sale!! Hurry and print this one before it disappears. Make sure to use zipcode 30187!